After we left Glacier, we wanted some down time so we could be rested, clean and stocked for my parents’ arrival. 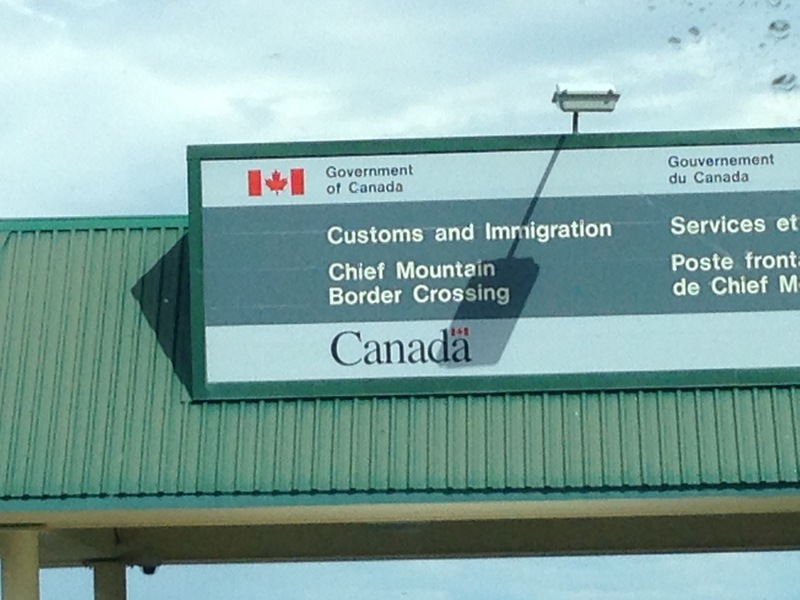 Crossing into Canada was uneventful, and I suspect using the border crossing that is basically on the edge of the Glacier-Waterton National Park was the reason. Side note: Did you know that Glacier National Park on the US side is part of the same land that is Waterton Lakes National on the Canadian side? Not to be confused with Canada’s Glacier National Park btw… Anyway, as we pulled up to the border crossing, there was only one vehicle in front of us (another RV), and we only waited about 4 minutes. The border control officer was laid back and funny, checked our passports, never asked for dog records, never boarded us, and told us we had to surrender our leftover firewood (not surprised as they want to avoid insect infestations that destroy trees) and our eggs (what???). After walking 3 dozen organic eggs back across the border and tossing them in a bin, I had a good cry (ok not really, but it was gut wrenching) and then we were officially on our Canadian portion of our adventure! We had been told Waterton Lakes was worth the detour, and indeed found it beautiful. 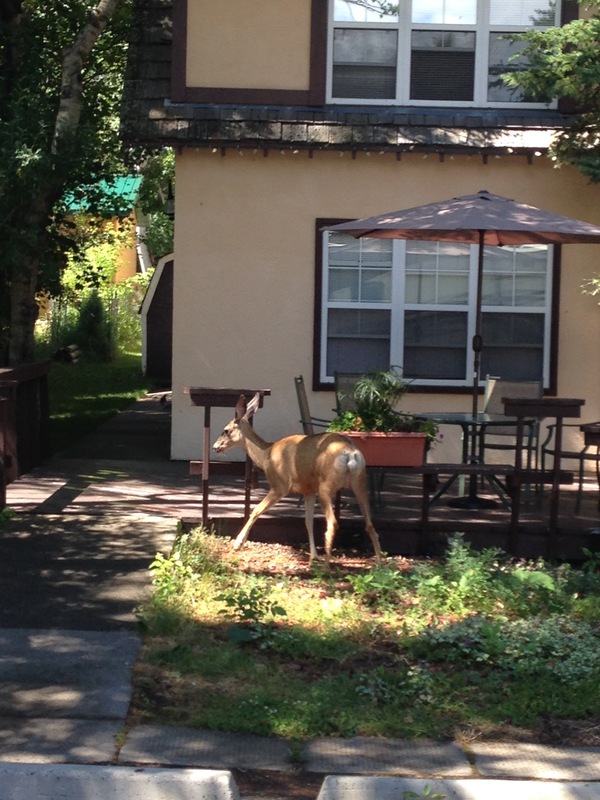 We found a spot to park Gypsy, unhooked the Jeep, snapped a picture of the deer that was right next to us as we did, and explored the cute little village. It was probably our favorite of the Glacier-Waterton towns we saw, though we didn’t spend a ton of time in any of them. We grabbed a couple paninis and then drove down the Red Rock Canyon Parkway to the Blakiston Falls trailhead. One difference between the US and Canadian sides of The Park, is that dogs were allowed on the trails in Canada! Yay! The trail was short, but it was great to move around and get fresh air in the middle of a long driving day. On the drive back, we noticed a few tourists looking over hill at some kind of animal, but most of it was on other side of hill. We pulled over though because the only animals we could imagine big enough to still see that far away were a moose or a bear. Raj grabbed the telescopic lens and we watched as a black bear nibbled its way onto the crest of the hill; he/she perked up when someone’s dog barked near us! 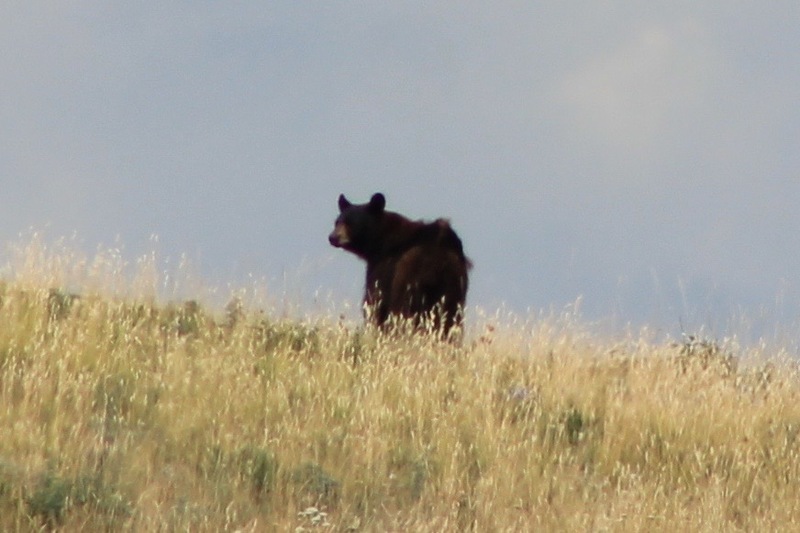 Our first bear sighting! There are differences between the Glacier-Waterton sides, yet both are insanely gorgeous. Waterton’s village is very nice and right on a lake. Waterton consists of more rolling hills than deep valleys like in Glacier, but both have jagged peaks and moraines. I might have to say Glacier is more unique and dramatic, but I wish we could have stayed in Waterton and explored more. Both sides are well managed – though roads in Waterton need repair, and the guy at Waterton’s visitor center was lame in comparison to Rangers we encountered on the US side. Hiking enthusiasts can’t go wrong either way. As we left Waterton, we still had 3.5 hours to drive to Kimberly and it was mid-afternoon. It was a fun and interesting drive. First, we passed The Frank Slide, which is Canada’s deadliest rockslide. 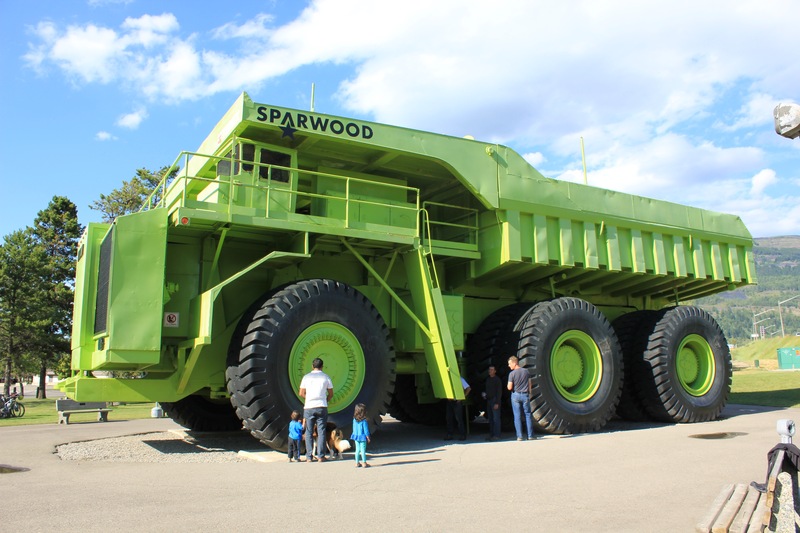 Then, just a a bit later, we stopped to the World’s Largest Truck! The kids enjoyed stretching their legs and climbing on the enormous wheels. We basically travelled all day long, but it was broken up and we saw so much throughout the day! When we finally arrived in Kimberly, we were beat, and ready to settle in and relax for a few days. We got all the down time we needed in Kimberly! We enjoyed lazy morning and tons of outside play, good naps, longs walks with the dogs to the river and deer sightings at every turn! We also found a great organic market selling local foods, and strolled around downtown Kimberly and let the kids play in their splash pond before cooking up salmon with zucchini and squash. Kimberly Riverside: large grounds with impressive circuit of hiking/walking trails with views of river, sites close together but some back up to views of the river – those sites weren’t suitable for us with young kids, but must be nice if you aren’t worried about your toddler falling off a cliff. 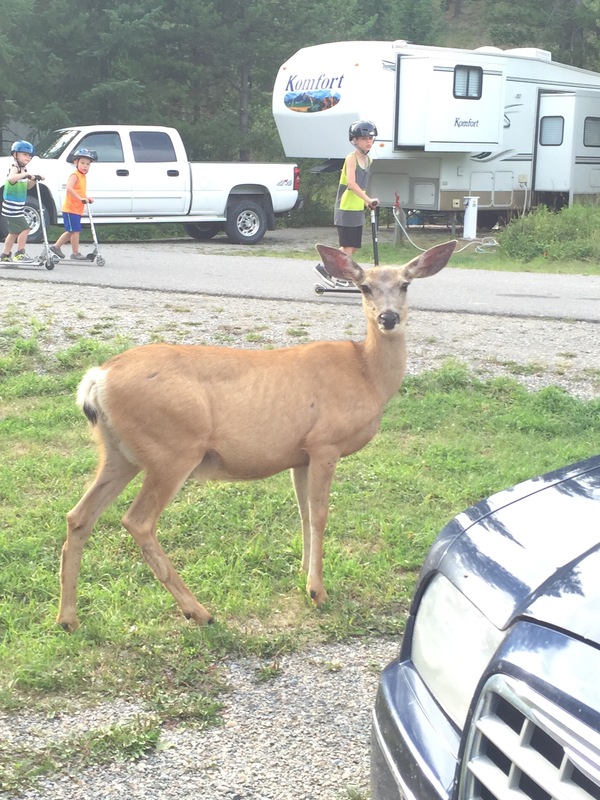 Tons of deer right in the sites, very family oriented. After three nights in KImberly, we decided to checkout the Fairmont Hot Springs. Upon check in, we were disappointed with our site at the way back, but soon discovered we were parked next to a great family with 4 kids! Nina was ecstatic! All we did that first evening was watch the kids run around and play together. The played so hard we actually got both of them in bed early (as in before 8pm!) and got some much needed sleep ourselves. Our last day before my parents arrived, we walked to the hot springs pools to soak and found it crowded but still enjoyable. London especially was delighted – he’s such a water baby! But oh my, it was SO cold getting out as there was a stiff, cold breeze. One nice feature of the place was that they drain the pools each night, so the water is always fresh even during peak season. After the pools, we buckled down to Clean clean clean the inside and outside of both the RV and Jeep. That meant movies for the kids for a few hours, but then our lovely neighbors came home and the kids played with their kids and Raj and I got busy drinking with our new friends, Sarah and Andrew. It was absolutely perfect to watch our kids explore new toys and bikes and scooters with their sweet new buddies, with a bourbon and ginger in my hand and the knowledge that we would see my parents the very next day! Fairmont Hot Springs RV Resort: Not sure what all the fuss is about with this one unless you just really like the pools. Sites close together, lots of mosquitoes, though our spot was heavily wooded and there were a few trailheads accessible. We didn’t have a deluxe site, but they seemed to be in the middle of all the commotion so doubt they are peaceful. Our site was way in the back, which worked out well with the kids because there was no thru traffic. Nice playground. Pools are nice, but don’t understand why it was named #1 by GSC; staff was exceptionally pleasant though.